As much as I appreciate that the LCBO’s periodic series of brewery features has been bringing in some great beers that Ontario drinkers might not see otherwise, I really wish the agency were a bit more organized in terms of release dates and distribution so that customers have a clearer indication of where and when the beers will be available. Case in point: The current release featuring a half dozen selections from Oregon’s Rogue Brewery was originally announced as being due in stores in late June, so I’ve been sitting on my notes from the early May media tasting, and was planning on posting something a bit closer to the release date. Then I got word that they’d be coming at the end of May, and got ready to write something sooner – until I head that it was back to late June, and held off again. And then the beers suddenly started hitting the shelves a week or so ago, and are already selling out in some locations, which makes this post a little less timely than I’d hoped. Now that I’m back to blogging on a semi-regular basis, I figure it’s about time that I catch up on posting reviews of a few beers that I received and drank during my unintended break. 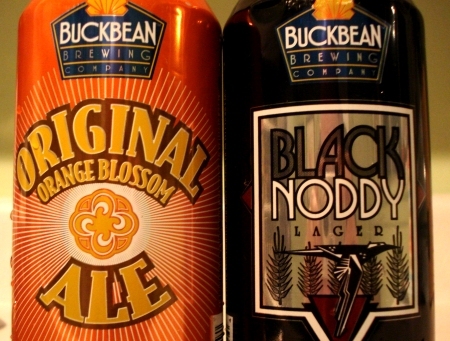 First up: A pair of brews from Buckbean Brewing Company, a relatively new brewery in Reno, Nevada. I was first contacted by someone at the brewery back in the spring or early summer with an offer to send me some samples to review. The first attempt to get a package to me failed when it disappeared along the way – likely due to thirsty customs agents opening it for inspection – so I arranged for a friend in Buffalo to receive a reshipped box, and eventually got the beers in September, at which point the ol’ blog was on an unintended hiatus. At least I was on the ball enough to take a picture when I drank them! 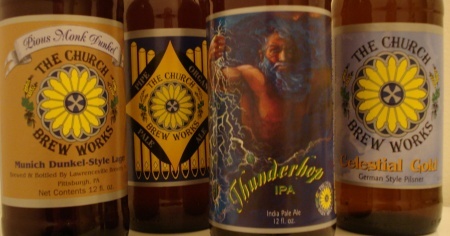 I was really interested in trying these beers for several reasons. First, I’d never tried a beer from Nevada before (not surprising, as the state isn’t exactly a hotbed for craft brewing action). Second, the styles of the brews – a schwarzbier and an orange blossom ale – are pretty unique for a fledgling brewery to come out with as their first offerings. And third, they’re in cans, which I’m glad to see more and more small breweries moving towards (for beers that are suitable for cans, at least). Slightly hazy orange-amber with a small white head. Aroma of orange popsicle and mild caramel malt with a hint of hops. Medium bodied. Fresh tasting, with notes of orange water, floral tea, sweet malt and mild herbal hops with a refreshingly dry finish. A nice, fresh, summery ale. Deep brown – almost black – with a medium tan head. Aroma of charred and roasty malt with notes of coffee and cocoa and a bit of smoke. Medium bodied. Flavour follows the aroma very closely – rich and roasty with hints of coffee, cocoa and smoke – and a dry, well-bittered finish with some nutty notes. Excellent! So, belated thanks for Buckbean for sending these beers my way (twice! ), and apologies for taking so long to post my thoughts on them. It’s been years since I’ve been in Nevada, but it’s good to know that there will be at least a couple of decent beers for me to drink down there if/when I ever make it back. A few weeks ago, through an odd series of events, I found myself in possession of a mixed case of beer from Pennsylvania. I’d tried a fair number of PA beers before, from breweries like Victory, Sly Fox and Weyerbacher, but this specially assembled collection contained an assortment from three breweries that I wasn’t very familiar with: Church Brew Works, Erie Brewing and Yard’s Brewing. As is usually the case with these things, the beers ranged from quite good to not-so-much, and I thought I’d share quick round-up of my thoughts on the 11 new beers I tried. I’ve long wanted to visit the Church Brew Works brewpub, which is fittingly located in a former church in Pittsburgh, mainly because the photos I’ve seen of the place look absolutely stunning, but also because I’ve been curious about their beer line-up since I had a chance to try their Oatmeal Stout on tap at Cole’s in Buffalo a couple of years ago. So I was happy to find these four bottles in the package, although unfortunately, most of them ended up letting me down. Pious Monk Dunkel is the best of the four, having a perfectly on-style clear brown-amber colour with a small head, and mild but inviting aroma of toasted malt, bread and tobacco leaf. The flavour is mild as well, but also good, with hints of coffee, smoke, toasted malt, and a short but pleasant bitter finish. Simple, but well made and satisfying. A bit less impressive is the Pipe Organ Pale Ale. It looks nice, with a sunset copper-gold colour and a small white head. But the aroma is odd, holding a faint caramel note that was overwhelmed by overripe (i.e. slightly rotten) fruit and something sharp that I can’t quite place. The body is moderately carbonated with a medium mouthfeel that gets a bit sticky as it warms, and the flavour is as suggested by the aroma – caramel malt, pungent fruit, and that sharp edge – followed by a moderately bittered finish. This is puzzling beer that I suspect might’ve been mildly infected, but not in a familiar sort of way. Thunderhop Double IPA seemed promising – for this hophead, it’s hard to go wrong with an 8% double IPA – but it’s ultimately a disappointment. As with the Pipe Organ, it looks nice in the glass – golden-amber with a moderate white head – but the overwhelming aroma of citric hops with a pineapple juice background is too much even for me. The flavour is equally unbalanced, with strong, acidic hops that have very little malt to back them up. I’m totally cool with hop-bombs as long as beer has a strong backbone for the hops to play against. In this case, the beer is just too thin and flabby, leaving the sharp hops with nothing to hang on. Finally, the real stinker of the bunch is Celestial Gold. I got nervous when I saw the very pale gold colour with a small white head that disappeared quickly. And my fears were proven to be well-founded by the grainy malt aroma with a slight vegetal note, the thin body with heavy carbonation, and the flavour that starts sweet before being overtaken by an unpleasant overcooked vegetable undertone, and an unbalanced bitterness in the finish. Supposedly a German-style Pilsner, but it seemed to me to be a simple mainstream lager, and a poorly made one at that. Like the Celestial Gold, Erie’s Presque Isle Pilsner is a pretty lacklustre take on the style, with a very light golden golden colour, a small white head, and an aroma of light malt, subtle hops, and an unpleasant note of cooked corn that builds as it warms up. Thankfully, the corn doesn’t come though in the flavour, but there not much else there either. The best I can say is that it finishes clean, with some mild Saaz notes, but it’s not much of a pilsner. 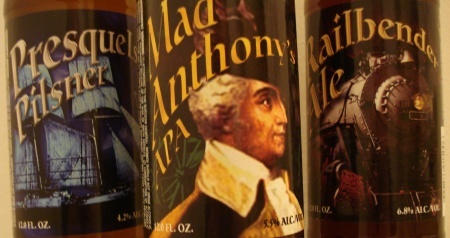 Mad Anthony’s APA is a good step up from the lager. It pours a clear golden-orange with a small but persistent snow white head, and the aroma is pleasant and balanced, with fresh-smelling malt and some slightly citric hops. The flavour is nice, following on the aroma with a good balance of sweet malt and tangy hops, and a good finish. The body is a bit thin, but the crispness makes it an enjoyable quaffer. From there, things take a bit of a dip with the Railbender Ale. The appearance is OK, with a clear light copper colour and a small white head. The aroma is a fairly bland combination of malt and tobacco leaves, with a slight sharpness building as it warms. The flavour starts with sweet malt, slightly sugary off the top, developing some caramel notes in the middle, and a moderately hopped finish with some alcohol warmth. Not bad, not great, just – meh. These looked to be the most interesting beers in the collection, and given the generally average to poor showing made by the other two breweries, I was hoping they’d prove to be the best ones as well. I was especially glad to see the Saison, a style that I’m a big fan of, and thankfully, it ended up being a pretty solid example. I was a bit worried by the very light, clear gold appearance, but the aroma has enough orange, coriander, and herb notes to keep me interested. The body is light and crisp, and the flavour is decent – a bit light off the top, but some pleasant candi sugar and spice notes come through in the middle, and the herbal hops wrap it up nicely. The Presidential ales intrigued me as well, with the promise of old-tyme recipes bringing to mind the Samuel Adams Brewer Patriot Collection that came out a couple of years ago. 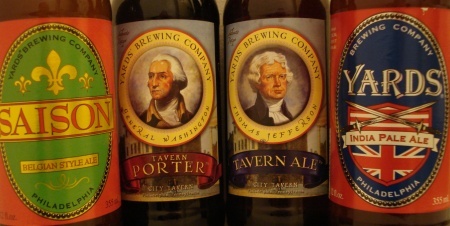 In fact, looking back at my tasting notes for the George Washington Porter in that Sam Adams collection, there seems to be a fair bit of similarity between it and Yard’s General Washington Tavern Porter. The Yard’s brew is ruby-brown with a small off-white head, and has a very roasty and malty aroma with some hints of chocolate, burnt toffee and molasses. The flavour is excellent, very full and toasty off the top, with molasses and toffee sweetness coming in quick, followed by an interesting plum-like tartness. Very nice. As for the Thomas Jefferson Tavern Ale, it couldn’t be more different from the Traditional Honey Ginger Ale that represented the third president in the Sam Adams pack. In fact, it comes across as a fairly modern US strong ale. Not that I’d complaining, of course. The appearance is a slightly hazy golden-amber with a small head, and the aroma of pine and grapefruit with hints of caramel and toast is solid. So is the flavour, with vibrant and fresh hops taking the lead in the flavour, but allowing enough caramel malt to come though for balance. Finally, the Yard’s IPA was another winner for me. Not the most unique or exciting IPA around, but still a good one, with the aroma having a good balance of sweet caramel and citrus, and the flavour being well-balanced and enjoyable, with a sweet beginning, and a pleasing hop bite in the finish. So, while I can’t make a complete assessment based on three or four beers from each brewery, the edge definitely goes to Yard’s based on my limited sampling, followed by Erie in second place, and Church Brew Works well in the rear. And putting them all up against the other PA breweries, none of them come close to most of what I’ve tried from Victory and Weyerbacher. 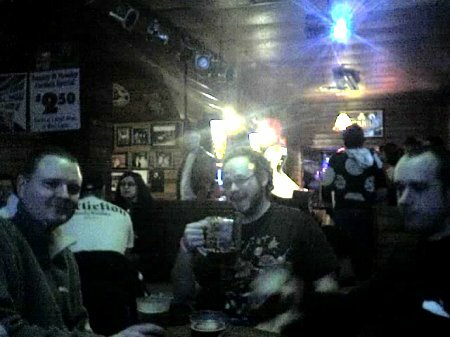 But still, it’s nice to get a taste of the local brews from other places. Hopefully, I’ll get to try more of what the state has to offer, maybe as part of a future Philly Beer Week. As I’ve lamented in this column at least once before, the representation (or rather, lack thereof) of U.S. craft beers on LCBO shelves is just pitiful. There are literally hundreds of small breweries in the States – some of them just a few miles across the border – making absolutely outstanding beers, yet the LCBO chooses to ignore them almost completely. Thankfully, though, there are a few import agents and beer-friendly establishments in Toronto who are willing to go through the hoops necessary to bring in a few interesting things from south of the border on a private order basis. On the bar and restaurant side of things, Ralph Morana at Volo was one of the first local publicans to get serious about private orders of American beers, and he managed to bring in some great exclusives by dealing directly with the breweries, although the red tape involved has caused him to cut back on these sort of orders for the foreseeable future. beerbistro is also fighting the good fight, with a slew of exclusive offerings in stock now for their American Beer & Barbecue Festival which launches tomorrow. As for the import agents, established middle men like Esprit are still repping a few solid breweries like Rogue and Dogfish Head, but an upstart agency from Burlington called Roland + Russell has been grabbing a lot of attention on the local beer geek scene in the last few months due to their rapidly growing portfolio of breweries from around the world. Somewhat ironically, one brewery in their fold that has garnered the a large amount of interest and orders is also the one that is geographically closest to us: Southern Tier Brewing of Lakewood, NY. One of Western New York’s top craft breweries, Southern Tier became known to many local beer aficionados last year when Volo brought in a couple of their beers. 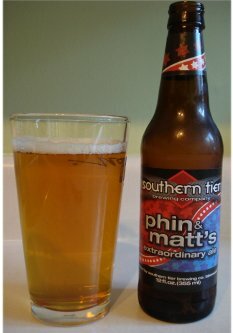 Like many American craft breweries, they have become known for brewing big beers with lots of flavour, lots of alcohol, and (usually) lots of hops, but their flagship brand is the slightly more subdued Phin & Matts Extraordinary Ale. I say “slightly” because compared to a lot of our local beers, this is still a pretty aggressive ale. It doesn’t look too threatening in the glass, just a nice clear golden colour with a small white head. But once you take a whiff, the pungent, grapefruit-like aroma of the Cascade hops favoured by many U.S. craft brewers makes it obvious that this beer has some balls. Those citric hops are prominent in the flavour as well, but they’re balanced with a good dose of malt that gives the brew a slight orange candy note, before it moves into a dry peppery finish. So on the eve of their Independence Day, I raise my glass to our neighbours to the south. If any of them are reading this, I say to them: I may not like your leader, your foreign policy, your gun laws, or your lack of universal health care, but I sure do like your beer. Happy Fourth to all, y’all! As a beer lover in Ontario, I have lots of things to complain about. Most of those complaints are directed towards the LCBO, where quality beer tends to be given short shrift while prime shelf space is given over to an avalanche of indistinguishable pale lagers from around the world. Especially embarrassing is the remarkable lack of American craft beer at LCBO outlets. I mean, here’s a country that is producing some of the more exciting beer in the world right now, and they’re our biggest trading partner and our next-door neighbour. Yet here in Ontario, there are only two US craft beers on the general stock list at our retail liquor outlets: Samuel Adams Boston Lager and Anchor Liberty Ale. Actually, make that three, because joining them this month is Brooklyn Lager ($12.40/6×355 mL, LCBO 26997). The flagship beer of the Brooklyn Brewery, this vibrant and flavourful all-malt lager was first released in 1987, a couple of years after the similar Samuel Adams Boston Lager was launched a bit further up the coast. Alongside the products of a handful of other craft brewing pioneers (including Ontario’s Brick, Upper Canada and Creemore Springs Breweries), these beers proved that not all lagers were pale, flavourless and full of cheap adjuncts like rice and corn. 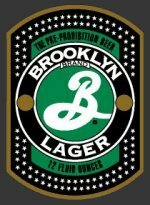 Even today, when there are so many other great craft beers on the market, Brooklyn Lager remains a standard bearer in its style. It has a beautiful deep orange-amber colour with a soft white head, and a fresh aroma of bready malt and orange & lemon notes from the hops. The flavour has some slightly fruity sweetness off the top, before those citric and slightly floral hops kick in towards the finish. Some have described it as seeming like a hybrid between a malty lager and a hoppy pale ale, and having finally tried it, I can see where they’re coming from. Hybrid or not, it’s one of the best lagers we’ve seen in Ontario in a long time, and I can only hope it’s a sign that the LCBO may be looking to bring in more brews from south of the border – but I’m not holding my breath on that one.